Port Maurelle, or anchorage No. 7 according to the Moorings charter chart that most people had, was a favourite - a wide, sheltered bay with good holding, clear water and a lovely sandy beach to look for shells. It even had fruit bats flying around the trees in the evening. Although called Port Maurelle, there is no port or anything else there except the half-moon beach surrounded by palm trees. 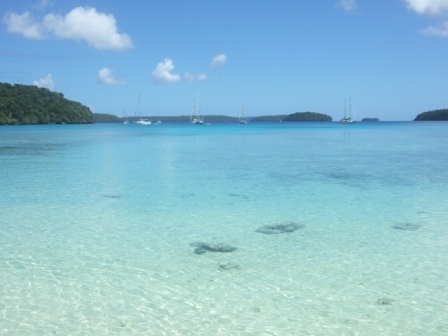 It was named after the Spanish navigator who was the first European to make landfall in the Vava'u islands. 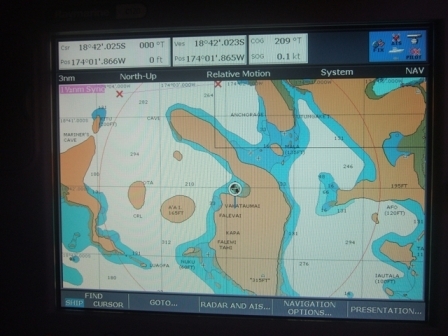 Aurora B anchored in the bay, shown in the middle of the chart. 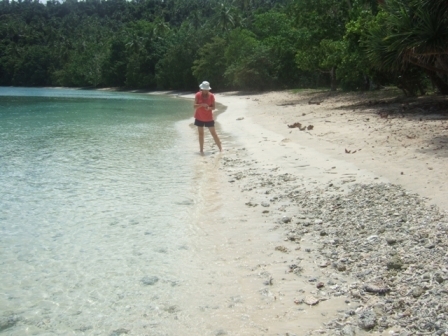 The seas within the island group are sheltered and give good sailing in flat water. It's an ideal place to come and charter, but we didn't see many charter boats. Possibly the expensive air fares to get here might be the answer! of coral in front of the beach. 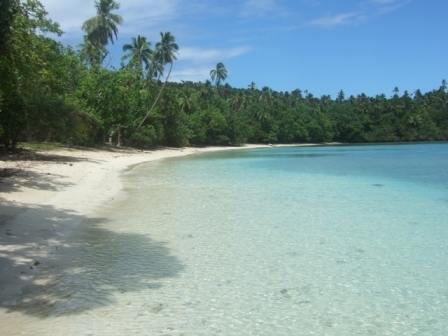 Just how we imagined the South Pacific would be! Liz looking for shells along the shoreline.